This component video down-converter is a component video to CVSB or SVHS converter, which allows users to view the high definition digital video content from HDTV source on a regular non-HD regular tube TV or video monitor using composite RCA video cable or s-video cable connection. With using this component RGB YUV to composite video converter, users can easily use a regular tube TV for watching high definition video content or use any standard video monitor for monitoring purpose. This HD video down converter is easy to use. The conversion is all done automatically. It also helps integrate your existing video recorder or AV receiver with the new HD video equipments with ease. This converter is very ideal for using in applications like video recording, video conference, business presentation, multimedia room, post production and many other professional setups. 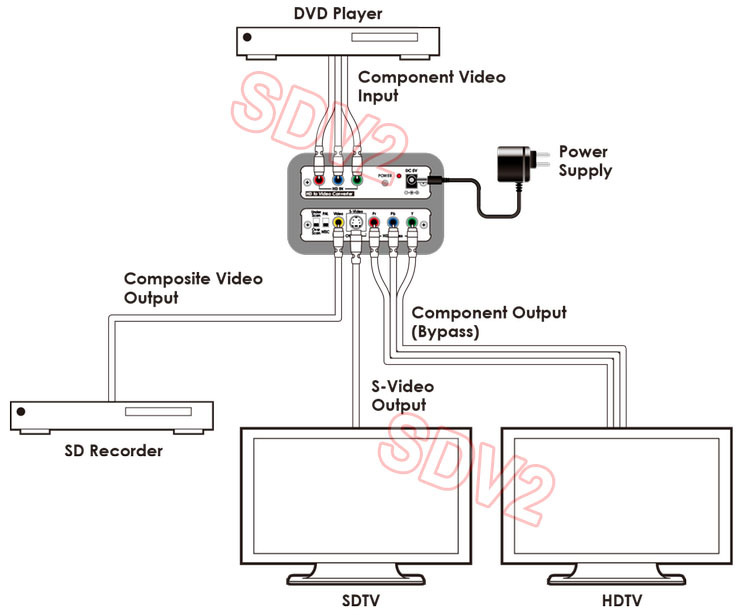 This component video to CVSB or SVHS converter provides instant decoding of the HD type video to facilitate the viewing of HD content on televisions or other devices that do not have component video input such as DVD recorder, DVR, computer capture device. Featured with one component video pass-through, this converter provides total of 3 video outputs, which includes 1 composite RCA, 1 S-Video and 1 component video pass-through which helps video distribution from satellite receiver, HD cable boxes, digital media players and other HD devices to multiple flat panel TV displays or AV receiving ends. The video input resolution is detected automatically by this converter and all component RGB YUV video format resolutions are supported from SD 480i/480p to HD 1080p. This unit also supports image overscan/underscan modes during the scale down process to ensure the wide-screen output from the HD source being displayed properly on a 4:3 screen display. This component video to CVSB or SVHS converter provides users with selection for video output standard. A NTSC/PAL switch is available on the front of the converter for users to choose depending on the configuration. This converter works great with all HD component video devices like Apple TV, Google TV or other set top boxes, HD media player by connecting the HD component output from a HD device to this unit and run the rca or s-video cable to a standard non-widescreen tube TV, AV receiver or video recorder. This unit can also be used for daisy chain connection with other HD video switches or distribution amplifiers for further broadcasting integration. Very suitable for for computer or HDTV setup in many professional or industrial applications. Professional component video to composite video down converter solution. 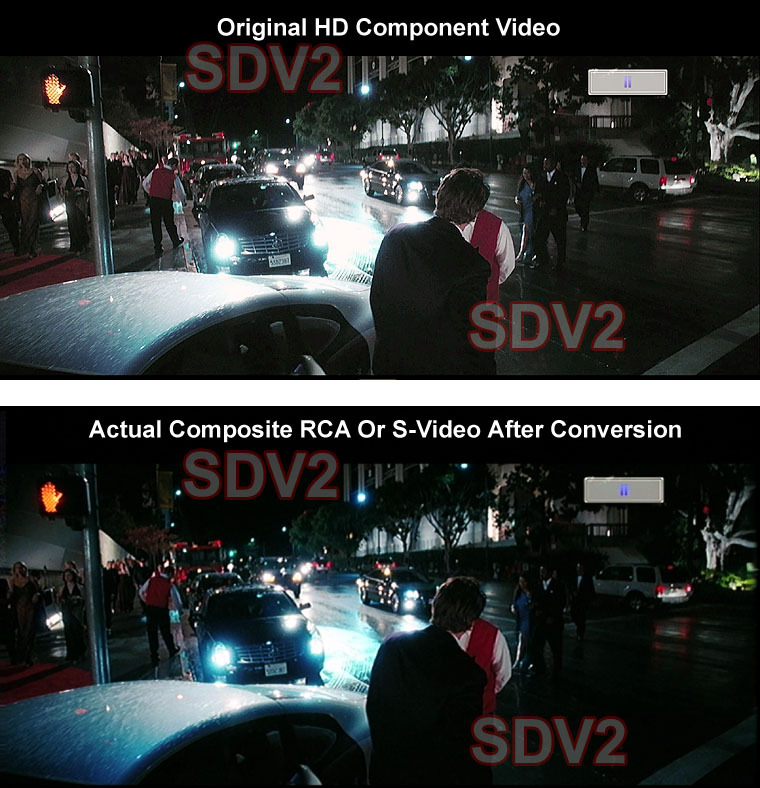 Instant HD video decoding with simultaneous CVSB and Y/V video outputs for display or video capturing. Supports advanced HD to SD color space conversion and motion adaptive video de-interlacing. Supports all component YPbPr and YUV video inputs including 480i/576i, 480p/576p, 720p,1080i and 1080p. The video input resolution is detected automatically. Selectable output video format in NTSC or PAL standard for worldwide use. Supports image overscan/underscan modes during the scale down process to ensure the wide-screen output from the HD source being displayed properly on a 4:3 screen display. Supports daisy chain connection with other HD or standard video switches or distribution amplifiers for further broadcasting integration. Sturdy metal enclosure with compact dimension. Featured with universal power supply with 110V-240V support and power plug kit for worldwide use. Overscan/Underscan for image size adjustment.